What is External Website Duplication? External website content duplication can be one of the most frustrating and potentially litigious for content duplication issues. This is where your website’s content has either; in part, or in its entirety been duplicated / copied and then uploaded to another website / webpage on the Internet. This may or may not be an issue for your website depending on a number of different criteria explored later in this article. One of the more unique components of our SEO Tools is how our machine learning algorithms assess and categorise external content duplication… We assess how much content is considered to be unique on each page; we identify legal disclaimers and repeated sales messages throughout a site and remove these from the analysis. For example, if you have a legal disclaimer, a top and side menu and a footer on each page; Raptor will evaluate how much of the remaining content is unique when compared to indexed content in Google. This score is represented by a percentage and our tool will show if / where potential partial duplicates exist. This can help you to identify why your content may not rank well, if it younger than existing content and very similar to it for example. As such our tool provides you with a breakdown of your content, how unique each page is, and where it may be copied from / to. Although we typically refer to duplicate content as being, Page-A is a duplicate of Page-B, Google can devalue content even if it not an exact duplicate but broadly very similar to another page. Google is pretty good at determining when and where content has been duplicated and so this isn’t a common problem. However, there are a number of tools that can check the content of a webpage to see if it appears on the Internet elsewhere, but these checks can also be performed for free using Google. This technique will only yield results that are by definition a potential problem for you because everything in the SERPs is indexed content. You can search for sentences or even paragraphs of content in Google if you want to know whether a specific piece of content has been indexed elsewhere on the net. If you produce news or maybe have your products sold or advertised on other sites; your content can be systematically duplicated. This is completely legitimate and won’t be a problem if managed properly. It is just something to consider when producing pages containing this content and liaising with other site owners using your content. Regular checks should be made by searching in Google to identify any problems that may arise in order to allow you to keep on top of this. If another website has duplicated your content and that content is indexed, it may be that they are enjoying ranking for their target keywords, with your content. Typically, Google will rank only one version of duplicate content and that is usually the one it indexed first. If your site isn’t crawled regularly and the offending site is, it may be that they were indexed first and hence your content marketing efforts could be thwarted by this issue. The issue will only be resolved or mitigated if the external website has setup a canonical tag on the page containing the duplicate content that links to your content (which is the original source). The only legitimate way to duplicate content in small pieces (not the whole page or the majority of it) is to link to the original content from the page citing it as the source. The impact of having your content duplicated on external websites is that your content may be devalued by Google, this will affect your ability to rank for target keywords. In the worst case, other websites may rank better than yours by using your content. If your content is indexed / ranking above that of the duplicate content, there isn’t a direct active problem. However, if this is not handled correctly this could become an active problem in the future. Resolving this is not as easy as simply placing a tag on a page because before this can be done, you must first contact the site owner and get them to either link to the original content or place a canonical tag on the page (both of these options are explained below). Most websites have contact information on them but if they do not, you will have to use whois or a similar tool to try and establish who owns the site and try and contact them using the details provided. 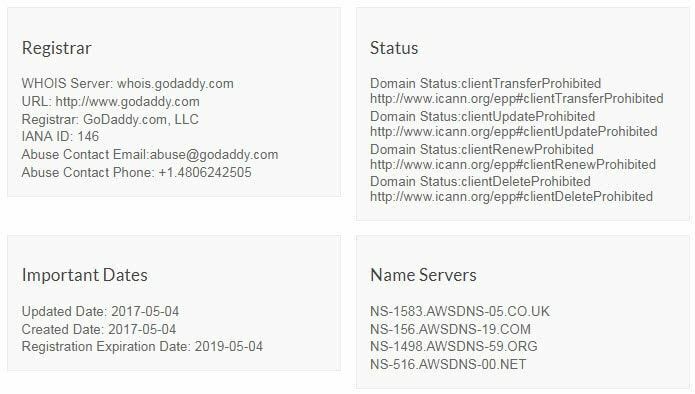 A Whois lookup can return results such as those illustrated below or they may return nothing of value if the domain was purchased with privacy protection. Use our external content duplication / content analysis tool to assess how unique your website content is, in contrast to other pages on the net. This can provide a range of recommendations designed to help improve your on-page content strategy. Once the site owner has been contacted, you can request that they implement a canonical tag on the offending page/s. This is a topic mentioned in greater detail in another article specific to canonical tags, but for the purpose of this article; ensuring that you have a canonical tag on every page of the site will prevent most duplicate content issues if not all of the ones from external site duplication. This will resolve the issue / prevent it from being an issue, if the whole page is duplicated on another website including the header source code. Bear in mind that this is only applicable if the content that was duplicated is only a small portion of the total content on that webpage. This is not ideal or recommended if someone has duplicated an entire page of content. Also consider that adding duplicate content such as this and linking to it provides you with no SEO advantage, it should only be done if it is relevant to the article and ultimately the user. When linking to a source, you have the choice as to whether to set the link to be a follow or nofollow link, which is explained in more detail by following the link. The quick answer as to whether to follow or not to follow, is usually determined by the credibility and nature of the source. If you are highlighting something bad then ‘nofollow’, if it’s a good, relevant, and trustworthy site, then ‘follow’. The only other option, if it is not possible to get the site owner /admin to implement one of the above recommendations, is to take legal action against the people or company stealing your content. In this case you have few options outside of legal avenues if they do not comply with your requests to either remove or handle the duplicate content correctly. In this case you should already have some kind of relationship with the external site and should be able to ask them to add canonical tags to the offending pages. Either remove it or handle it correctly, otherwise you could end up being the recipient of legal action! Controlling the URL’s from which your site & pages can be accessed prevents the potential impact from duplicate content issues. In the case of external website canonical issues, resolving or preventing issues can protect your content and your investment in that content.